For other uses, see Quail (disambiguation). The collective noun for a group of quail is a flock, covey, or bevy. 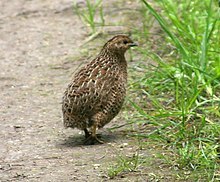 Quail that have fed on hemlock (e.g., during migration) may induce acute renal failure due to accumulation of toxic substances from the hemlock in the meat; this problem is referred to as "coturnism". ^ 2007 Census of Agriculture: United States Summary and State Data Volume 1 • Geographic Area Series • Part 51 AC-07-A-51 (PDF). USDA. February 2009. p. 423. ^ "Japanese Quail - Lancaster County 4-H (japanesequail) - Nebraska Extension in Lancaster County - University of Nebraska–Lincoln". lancaster.unl.edu. University of Nebraska-Lincoln Web Developer Network. Retrieved 15 March 2018. ^ Tsironi M, Andriopoulos P, Xamodraka E, et al. (2004). "The patient with rhabdomyolysis: have you considered quail poisoning?". CMAJ. 171 (4): 325–6. doi:10.1503/cmaj.1031256. PMC 509041. PMID 15313988. Look up quail in Wiktionary, the free dictionary. "Quail" . Encyclopædia Britannica (11th ed.). 1911. "Quail" . New International Encyclopedia. 1905.